I love me a good one-trick-pony app that solves a critical problem in life, and Scheduled is just that: it lets you schedule texts in the future so your messages are sent out at the most appropriate time to your contacts, and it works with a host of services, including WhatsApp, Telegram, Line, and SMS. Available for Android, it simply requires you to key in your message (and add a picture, if you like), choose your recipients from your contact list, and set a time for when you want your text to be sent. Now, you’ve got a couple of options: you can either have an SMS sent automatically at the time you’ve specified, or you can have the app prompt you at said time to choose which other messaging app you’d like to use. 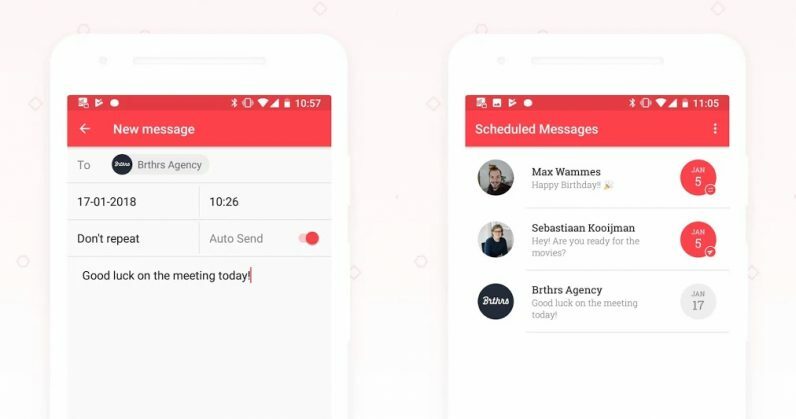 After you’re done lining up your message, Scheduled will prompt you at your specified time with a notification to choose which messaging app you’d like to use to send your text. Pick one from the list, and it’ll fire it off as painlessly as possible. There’s also an option to have your message sent out automatically at the specified time, but that only works with SMS, owing to the limitations stipulated by other apps. You’ll also find that sending these messages via WhatsApp requires an extra step when compared to, say, Telegram, and again, that’s down to the way the messaging service works. Still, it’s incredibly handy for when you want to remind people about something, check in on a loved one, or greet your contacts on special occasions. Speaking of which, Scheduled includes a neat feature to import your contacts’ birthdays so you can ping people on the day with minimal effort. Oh, and it can also duplicate texts – either automatically when you choose a periodical repeat option, or manually when you swipe left on a message in the list of scheduled texts. Scheduled is almost entirely free to use with ads, save for the auto-send SMS feature which you can unlock with a monthly in-app subscription of $1 (yes, it also removes ads). If you text a lot to keep in touch, that seems like a fair asking price for a tool that works with several services, looks good, and is dead-simple to use. Find Scheduled on Google Play.